This spacious and comfortable ground floor 2 bedroom 2 bath condominium measures 1,405 sq. ft. & has direct access to the pool area and out door grill. Marble flooring through out & travertine tiled bathrooms. You'll enjoy the large sliding doors that open up the living and dinning room to allow the morning sun to shine in. You have a comfortable living/tv room just off of the master & kitchen area. The kitchen is an open design fully equipped & stocked for your enjoyment. The master bedroom has an ensuite bathroom while the second bedroom shares the full bath as a powder room. 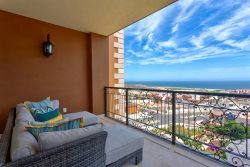 This condo came pre-furnished with everything that the family needed, including kitchen supplies, washer/dryer, Jacuzzi, 3 TVs with full cable programming, plus immediate access to the beach, marina, and downtown Cabo. Diana and Jorge from Lifestyle Villas were extremely professional and helpful, and the building staff was always available with 24/7 service and to help out or to answer questions. Would recommend to all. Always amazing to stay in the One Medano Beach condo complex. Steps to the beach and steps to the harbor. The condo was perfect! So luxurious!